Google announced that you can now add up to 15 people to a Google+ Hangout if you are business, government or school using Google Apps with Google+. Some exciting updates this week for Google Apps for Business/Gov/Education users of G+! 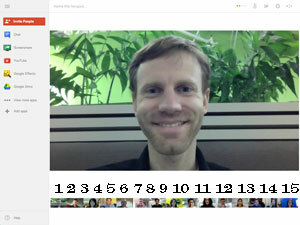 Starting this week, you’ll be able to invite up to 15 people to a hangout, compared to the previous 10-person limit. And finally more schools will be able to use Google+. Until now, Google+ has only been available to verified higher education institutions. Now, any school using Google Apps for Education can enable Google+ and access the same features that businesses and government can. I know many businesses and schools who felt limited by the ten number, so upping it to fifteen definitely in an improvement. These new features will be rolling out to Apps for Business, Education and Government customers over the next few days.